Choose one and stick to it! Spring. It's a Great Time of the Year... Or is it? Luckys Story - Time to Retire a Gentleman? Off Rye Grass and Winning Classes! LG miserable with sore feet! Home / Articles » Choose one and stick to it! Feed pre-mixed feeds that include vitamins and minerals. Actually there is a third option and that is 'don't bother at all' in the hope that the grass and any other feed will provide sufficient nutrition to keep your horse healthy. Spare horses or those not being ridden are often left to their own devices in this way but if you want the quiet ride at the weekend, the best performance at the event or a strong, healthy foal, then best not to take any chances. Most people want to do their best by their horse so will go for the other options. The most important thing is to choose option one or two and stick to it! 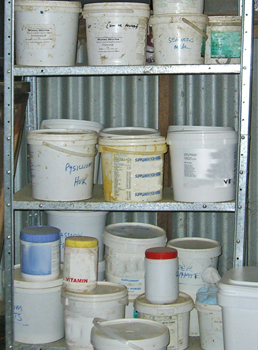 Feeding a scoop of a pre-mixed feed and then adding bits and pieces from other sources leads to your horse's nutrition being a 'hodge-podge'. You run the risk of doubling up on some elements and not providing enough of others. This can have more serious consequences for your horse than what you at first think as you are tinkering with his delicate metabolism. Doubling up on nutrients like selenium can lead to serious toxicity issues. We have to confess this is what we used to do. Our feed sheds were full of this and that because 'somebody said' this or that. It was in fact a clear sign that we really did not know what we were doing! Nowadays we know better and have had the BEST results since simplifying matters, by feeding plain feeds and adding the most sophisticated vitamins and minerals available that are already mixed in the correct ratios and contain the necessary co-factors. Co-factors are other vitamins or minerals which are necessary for the original mineral to be absorbed or to help it perform its function. For instance, magnesium is a vital co-factor for calcium to be deposited into bones and vitamin E is necessary for selenium to do its many important jobs. You can vary the carbohydrate (sugar and starch) content of your horse's diet without varying the dose of vitamins and minerals. If your horse needs to lose weight you can cut down the carbohydrates without messing with his mineral levels and conversely, to gain weight you can safely add carbohydrates and fat without upping his vitamins and minerals. When varying the amounts of pre-mixed feeds you are varying everything in that feed. You can add top quality vitamins and minerals which contain organic forms of minerals which are more quickly absorbed, better utilised within the horse and better stored when necessary. They are already attached to their appropriate amino acid so are not available to interfere with the absorption of other minerals. This is especially the case with minerals like iron. Horses are usually well supplied with iron as they are always nibbling around on the dirt. If a supplement contains large quantities of inorganic iron then it will be detrimental to copper, zinc and vitamin E absorption. Organic iron, on the other hand, being already attached will give maximum use of the copper, zinc and vitamin E in the blend. This means superior synergy of the whole brew giving you the most value for money. In other words, the effect of the vitamins and minerals in combination is far greater than if you added the effect of each separate component. This happens particularly when you have key minerals available in certain organic forms and in the company of their appropriate co-factors. Accurately balancing minerals in your horse's diet. This is only possible if the diet is always the same as in a situation where the horse is stabled 24/7 (certainly not an ideal situation for any horse). If your horse consumes hay 24/7 which all came from the same source, then it is possible to have that hay analysed for mineral content. And you can obtain the mineral content of other hard feed he is receiving. However, if your horse is on any green, growing grass then it becomes impossible because the mineral content of the grass changes with the season, the weather, fertiliser applications and so on. In other words you would not want to base your horse's diet on one grass test because it could be different tomorrow or in a few weeks time. When horses become minerally deficient or imbalanced it will show as perplexing health and behavioural issues, impaired movement and increased developmental orthopedic diseases in foals. Horses 'down' on their vitamins and minerals are significantly more susceptible to the effects of high nitrates in the grass, and are more prone to grass tetany. In addition they are far more susceptible to infectious diseases as they will have a compromised immune system. Supplementing with effective vitamins and minerals is absolutely the economical way to go when you consider the alternative costs of all the on-going investigations and treatments when you cannot figure out what is going wrong! Thousands of dollars when you start adding up! Better to spend your money on good hay (to correctly feed the flora in the hind-gut with the coarse, fibrous material it is designed to process) and good vitamins and minerals, the building blocks of superb health. Health bills go down, riding enjoyment goes up! It is an unfortunate fact that most of our horses are finished their useful lives before they are twenty. They should still be rideable at least to their late twenties and early thirties. For one thing they can only live as long as their teeth! Chronic lifetime deficiencies of minerals like calcium, magnesium, boron, phosphorous, copper, zinc and vitamin D will mean early onset of bad dentition. Retirement comes too soon due to degenerative diseases like osteoporosis and arthritis. Sway backs develop and/or Cushings sets in. All these conditions could be postponed for a good five to ten years by providing high fibre and minerally balanced diets since conception!